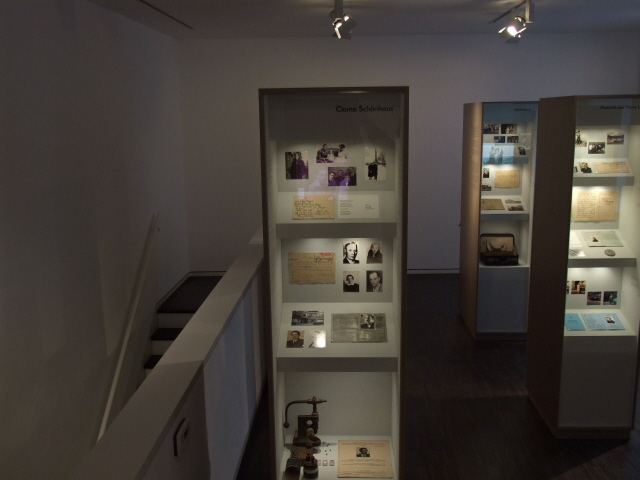 A small memorial museum in Berlin dedicated to individuals who helped persecuted Jews during the Nazi era, both within Germany itself and in occupied territories. More background info: Opened as recently as October 2008, the "Silent Heroes Memorial Center" is a relatively new addition to Berlin's wide range of places related to the city's (and Germany's, even the world's) darkest chapter in history: the Nazi era – although here, some of the few positive exceptions to the general horror and evil are celebrated: those attempts by various individuals at helping Jews in their desperate situation, which moved from marginalization to persecution and the Holocaust. But not only attempts that were successful are covered here, also unsuccessful ones, i.e. tragic failures. This makes it even more of a dark site than the wider context alone does. What there is to see: Not much, but more concentrated detail than you would at first expect. 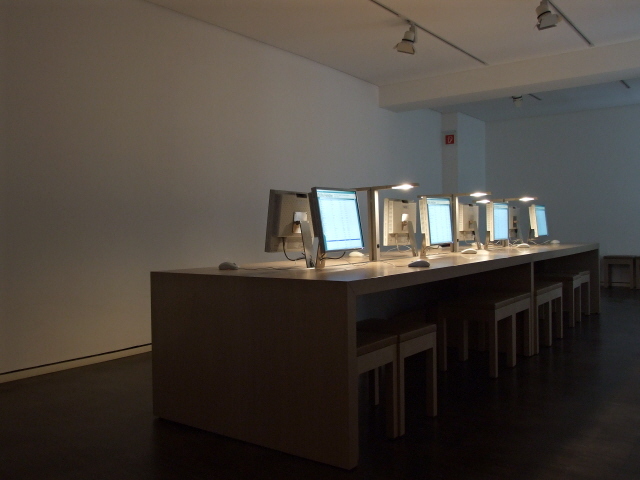 The small centre is on two levels: a general intro section with text panels on walls and a large table-like cluster of interactive touch screens set into the "table" surface. 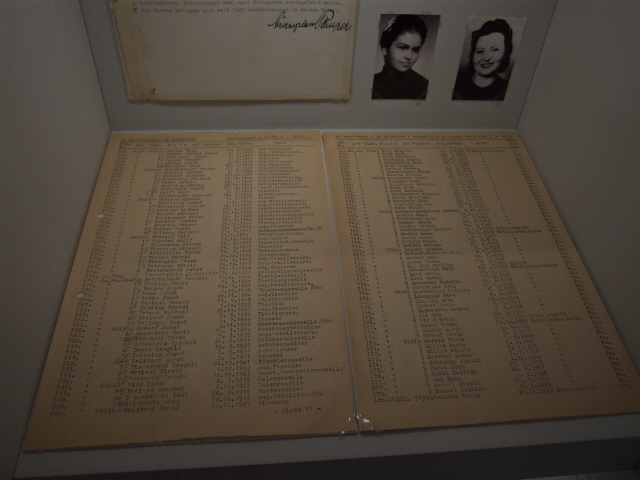 These provide more background information about the historical context as well as about individual instances of persecuted victims of the Nazis receiving help. The main part of the centre is upstairs, though. 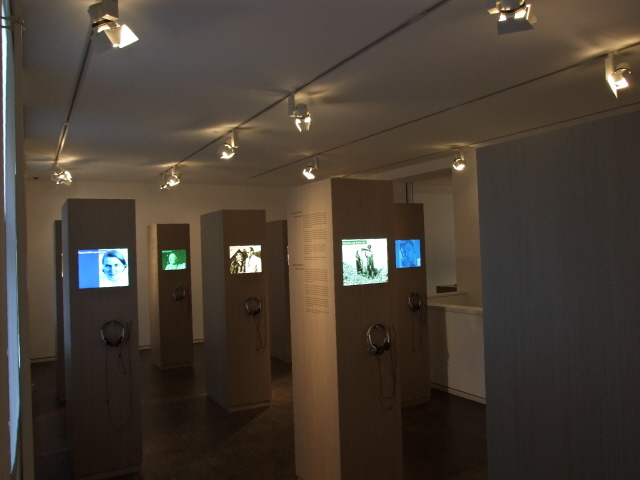 Here more screens with individual stories, soundtracks provided on headphones and texts are complemented by original artefacts related to particular individual stories. The layout is unusual, in that the exhibition consists of a number (8 to 12, I didn't count them exactly) of tall square "columns" each with a screen & headphones on the one side, and a small display cabinet on the other. These tell – and illustrate – a selection of individual cases in more detail. The assorted objects displayed include personal letters, photo albums, forgery equipment, suitcases and documents. One standing out especially amongst the latter is an early copy of the famed Schindler's List (see Krakow). In a wing branching off to the side of the main exhibition room, there is in addition a long table with eight computer workstations, at which you could retrieve yet more background information – albeit in German only, as far as I could tell. 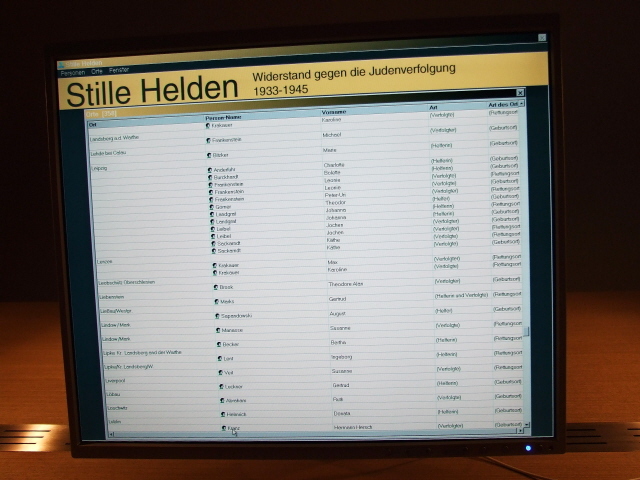 The descriptive texts in the exhibition itself, on the other hand, are bilingual throughout (German and English), with a high level of translation quality (this also applies to the downstairs interactive touch screens) – although original text documents in the display cabinets (such as letters) are left untranslated. 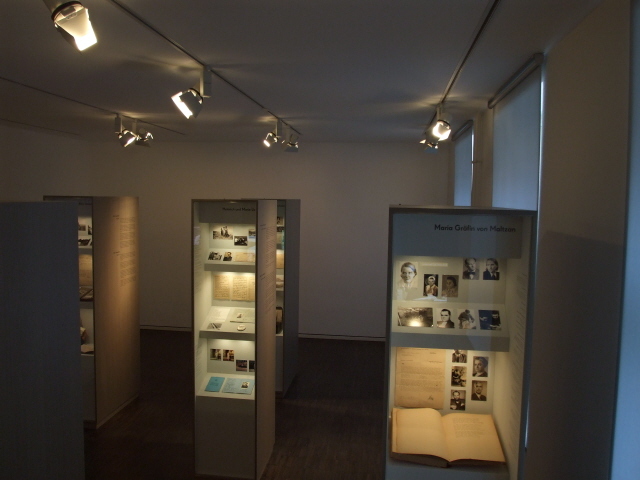 The exhibition may not be overly comprehensive, but it's certainly educational on a small, individual level, revealing many a previously unknown personal story (the extremely well-known story of Schindler is an exception here!). It's probably rather a special interest destination, but a worthwhile addition, if not a counterpoint, to Berlin's many Nazi-era-related dark sites. 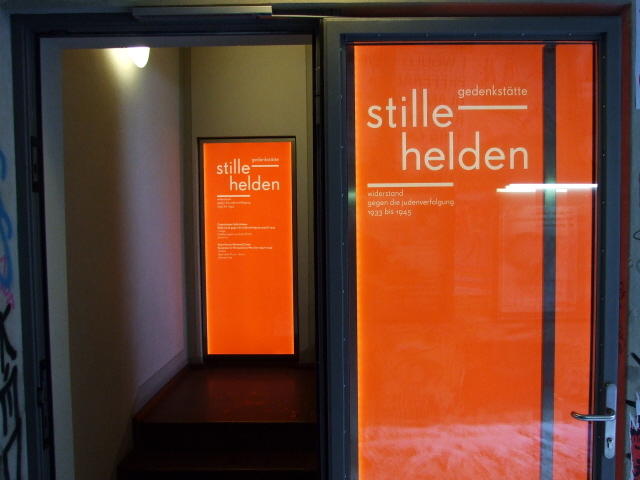 Location: at 39 Rosenthaler Straße in the central Mitte district of Berlin, between Friedrichstraße and Alexanderplatz/Prenzlauer Berg. Details: thanks to its central location, the place is easy to get to: it's just a short walk from the regional metro strain (S-Bahn) station Hackescher Markt (S5/7/9/75). From the station walk north and up Rosenthaler Straße about halfway along the first block. Alternatively get the metro line U8 to Weinmeisterstraße and walk west then south, down Rosenthaler Straße. Look out for the access to the narrow courtyard at No. 39 (a "shabbier" building than next door, with a cinema sign over the archway – see the photos in the gallery). The Silent Heroes Memorial Center is immediately on the left under the archway (red signs). Time required: not too long, though possibly a little longer than you'd think given the memorial centre's small size. But reading every detail could take up about 45 minutes to an hour. Many people, however, are more selective and make do with half an hour or less. Extra time can be spent at the centre's computer workstations. Combinability with other dark destinations: Almost literally next door (namely just two doors further into the courtyard at Rosenthaler Straße 39), and thus the most obvious combination for location alone, is the Museum Otto Weidt's Workshop for the Blind, which is also another outpost of the German Resistance Memorial Centre (which itself is located at another site, in Tiergarten, in West Berlin). The link between the sites could therefore hardly be closer thematically either. Only a few steps further into the narrow, long courtyard is the Anne Frank Centre of Berlin, yet another site that is thematically related, but in this case it is an independent undertaking and also stylistically very different. But it's certainly worth a look when visiting this pocket of Berlin. Just west of the Hackesche Höfe next door (see below) there's also a (former) Jewish cemetery, largely destroyed by the Nazis (only a few headstones with Hebrew script are left) it was also used as collecting point for deportations of Jews to concentration camps. Today a memorial sculpture marks this too – otherwise the place is more a little quiet park. Access is from Hamburger Straße on the western side of the park/cemetery. The proximity of the transport hubs of Alexanderplatz and Friedrichstraße provide good access to most of the city's many other dark sites – see under Berlin. Combinability with non-dark destinations: The "Hackesche Höfe" redevelopment right next door (access to the series of courtyards is at No. 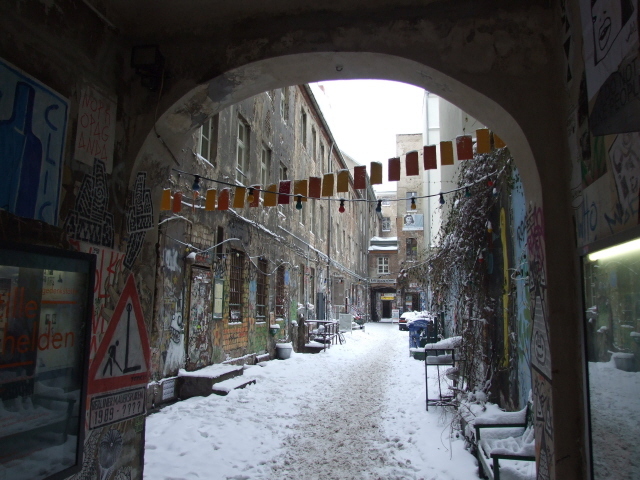 40, Rosenthaler Straße) is in a way the mainstream antithesis to the graffitied "Indie" appeal of the courtyards the Silent Heroes Memorial Center is located in. The Hackesche Höfe are the squeaky-clean, commercialized, heavily advertised (no: marketed, branded, even) counterpart, with boutiques, expensive restaurants and the lot. Needless to say, it draws more mainstream tourists. The whole area, including the district of Prenzlauer Berg to the north-east (formerly East Berlin's intellectual/alternative hotbed), has become rather "hip" and in part "gentrified" too. Lots of shops and restaurants have found a home here. Worth exploring. To the south(-west) it's not far to the heavy cultural heartland of Berlin, with the Museum Island as its core and main draw.